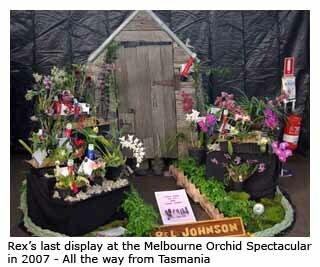 There is nothing difficult about building an orchid display at your local orchid show. 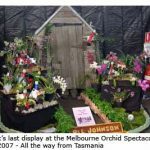 The number of flowering orchids available will determine the size of your display – the biggest mistake that beginners make is crowding their plants too closely together. Let us assume that you have enough plants for a display measuring about 2 m x 2 m. There is seldom a restriction on the height (except the height of the ceiling) but I would advise a maximum height of 2 m for your display so that the judges can comfortably see all the flowers. For the same reason, don’t place your plants on the floor, as the judges don’t like getting down on hands and knees to assess them. Basic building materials for a display may include foam boxes, milk crates, bread trays, wooden planks and portable shade-house benches. I use milk crates at the front of my displays and construct higher shelves behind them in a tiered arrangement. Then I lay heavy cardboard or plywood on top to provide a stable base. If the display is to measure more than 1.5-2 m from front to back, it’s an advantage to leave a space in the centre so that the judges can step in for closer inspection of the plants and so that prize cards can eventually be placed in position. Finally, cover the lot with black cloth or hessian. Now for the artistic part, which requires a bit of imagination, so give yourself plenty of time. I begin with my tallest plants, which I place towards the centre at the back of the display, and then put slightly shorter ones on either side. Be mindful of their colours and try to balance similar colours on each side of the display, especially with the larger plants. This basically sets the theme and smaller plants can now be placed in the body of the display. To provide a graceful gradation in height from side to side and back to front you may need to stand some plants on upturned pots to adjust their height. Your best orchids should stand out from the others and say to the judges “Here I am, look at me”! Now stand back and look at the display from all angles. Don’t be afraid to move some plants so that they are presented to better advantage. If there’s time and you haven’t had much experience, ask a senior member of the society for an opinion as to how you might improve the arrangement. Having finalised your arrangement, it’s time to place your labels on the plants. They should be easily legible from the front of the display but not so large as to dwarf the flowers. I prefer black or dark green labels with white writing. Finally, camouflage the pots as much as possible with potted ferns, Sphagnum moss or Spanish moss. Don’t be unduly disappointed if your first display doesn’t win its section. You will learn from the experience and should do better next time, especially if you critically compare your display with the winner. Provided you ask them after the event and at a convenient time, most judges will be happy to give their opinion as to how your display could have been improved.